Black Seed and Shea Butter Moisture Cream 6oz. Natural Pleasant Smell Butter Blend 6 oz. Tea Tree Oil Blend 4oz. 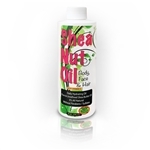 Shea Butter Nut Oil 8 oz.